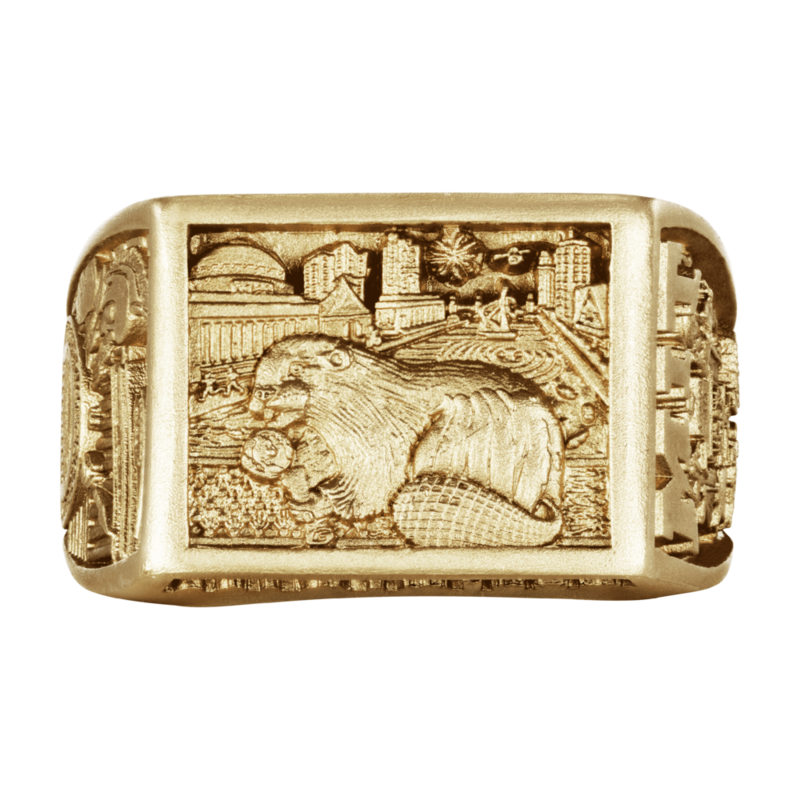 The beaver, MIT’s mascot and nature’s skilled engineer, is shown here proudly wearing the GradRat ring on its left ring finger. 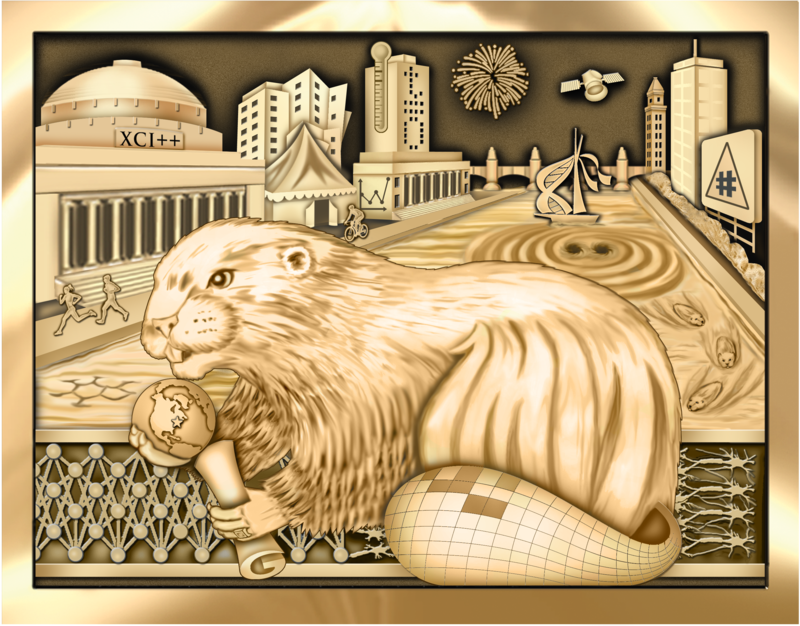 MIT’s global significance is marked by a star on a globe held in the beaver’s right hand. On the left hand, the beaver proudly holds its degree, with the lower fold spelling out the letter “G,” which represents the MIT registrar’s course designation for graduate students on WebSIS. The “G” also symbolizes that this ring is unique to graduate students. The beaver’s tail depicts the numbers 1 through 5 in binary, representing the five schools at MIT. The fur on the beaver’s back spells out “One MIT”, highlighting the inclusive nature of the culture at MIT: no matter what department, nationality, race, religion, gender or sexual orientation we represent, we are all united, as proud MIT students. The beaver stands on the famous Harvard bridge, which connects Cambridge and Boston. The railing of the bridge intertwines biological neural networks and artificial neural networks. It symbolizes MIT’s advances in artificial intelligence research as it continues to positively impact many traditional disciplines, as well as the inspiration that various fields have provided to artificial intelligence. MIT’s iconic dome bears “XCI”, the Roman number for 91: the number of Nobel laureates that have been affiliated with MIT to date. The two plus signs next to XCI indicate that that this number will continue to grow in future. Two runners and a bicyclist along the Charles River Bike Path portray the respite graduate students often find after a long day of research and classes. Next to the dome, the tent reminds us of MIT’s highly popular outdoor festivals and dance parties which have become an annual tradition, bringing together all members of the MIT community in celebration. Alongside the river, we show selected MIT buildings that play a central role in many graduate students’ lives during their time at MIT. Shown is the highly recognizable Ray and Maria Stata Center, and the famous Walker Memorial building, whose west-facing wall bears a graph depicting the ups and downs of a typical graduate student’s time at MIT, ending on a high note at graduation. This graph also symbolizes qualifying exams, teaching endeavors and thesis defenses, all of which are integral components of many graduate students’ tenures at MIT. The windows of the Green Building spell out “t=0”, which is shorthand for “the time is now”. It refers to a longstanding culture of graduate students starting entrepreneurial ventures while at MIT. The upside-down thermometer affixed to the Green Building serves as a reminder of rising global temperatures resulting from anthropogenic climate change. Two marks are clearly visible on the thermometer, reminding us of the climate agreement set in Paris to limit the increase in global average temperatures to well below 2°C. It also signifies MIT’s commitment to addressing climate change. Crossing the recently renovated Longfellow Bridge at the far end of the skyline, we enter Boston, illustrated by the Custom House Clock Tower, the Prudential Tower and the iconic Citgo sign. The hashtag in the center of the Citgo sign represents the active participation of graduate students in a wide variety of topics important to them, by voicing opinions online or by engaging in vibrant discussions with fellow scientists and citizens. The fireworks above the Longfellow bridge commemorate MIT’s centennial of moving from Boston to Cambridge as celebrated in 2016 with a lavish fireworks display. The satellite next to it highlights MIT's pioneering efforts in outer space research. A sailboat is shown in the center of the Charles river, demonstrating an activity graduate students fondly undertake during their tenure at MIT. The boat’s sail, shown as a DNA strand, symbolizes MIT’s advances in biotechnology and gene editing. It is being cut precisely by a scalpel shown as the boat, and a pair of scissors shown as the mast. Washing up against the boat are gravitational waves from a binary black hole merger, a groundbreaking Nobel-prize winning observation by the LIGO and Virgo collaborations in 2015, with a significant contribution from MIT researchers. Three beavers in the river point to the main beaver on the bridge, demonstrating leadership and teamwork. In the left corner of the river, a caffeine molecule can be outlined in the waves, symbolizing the fuel that many graduate students rely on to spend long nights on their various projects and research. Yellow Gold GradRat with RAW finish.